Antique wrought iron wall-bracket for lantern or sign, with (reversible) extending bar and tulip finial with an iron hook. 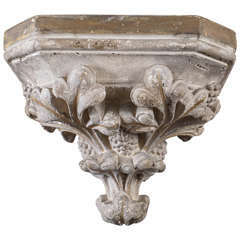 Handcrafted and smithed from iron bar and painted white with signs of gold highlights, the quatrefoil design is typical of the historismus/nouveau style, circa 1900-1915. Unrestored condition, so it's ready to repaint in the colour of your choice if you wish. The tulip finial was painted gold but has dulled over the years. The wide spread of the bracket on the wall ensures it will be fully secure when fixed using the mounting holes provided. The bracing plate spans an area of approximate 43 x 38cm (17 in x 15 in) x The 76 cm (30 inch) reach can be increased using the extending arm, allowing for example a lantern to hang up to 100cm (39.5 inch) from the wall. The bracket could also be used in the inverse position for a name board, or longer sign.